For many of us, this time of year is when we spend more time inside our homes. It's also a great time for reflection on what is truly important in your life. Is a greener planet important to you? It's easy to take steps in that direction - and be part of the 1% for the Planet global movement - when you #purchasefortheplanet from our business members. Their varied products are accessible and can be part of your everyday life all year round. From food storage and cleaning solutions to gorgeous tables and linens, our member brands give back to our trusted nonprofit partners who create positive impact everyday. "Our membership demonstrates just how committed we are to our environment. Being a 1% for the Planet member not only gets us thinking about the bigger picture, it makes us part of the bigger picture. In harmony with this value, a part of our company's mission is to educate people about sustainable environmental practices. Our membership promotes these conversations to take place with our clients, vendors, other professionals, everyone we do business with or even bump into on the street. Just having the logo put on all our company gear gives us potential for starting a conversation about our environment, who Garden Life is and how we care." You stock your fridge with the best products for you and the planet, so why not the rest of your kitchen too? 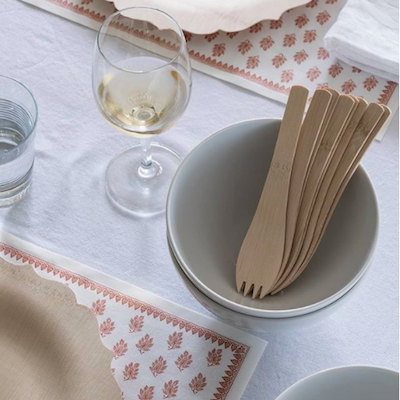 Store your leftovers using beeswax wraps from Khala Cloths. Aplat makes culinary totes which also make lovely gifts. Did you know that zero-waste products can be so beautiful? When you do need single-use items, consider compostable tableware from brands like bambu (photo at left) with their variety of fun serving pieces and World Centric who offsets all their carbon use. For cleaning up, be sure to get your bamboo paper towels from Caboo Paper Products and recycled kitchen trash bags from Evolution Bags. Other member businesses like NaturCleen and The Refill Shoppe make effective natural cleaning products. You can even store your cleaning solution of choice in a reusable bottle from Cleaning Essentials. Don't forget to purify your water with GoPure Pod at home. And look for a focus on our natural food and drink business members coming soon! Make a (green) statement with dining room products from around the world. Start with gorgeous dinnerware from British Columbia made in Poland by the Art of Pottery. Next choose napkins and tablecloths from Australia's recycled-chic JeanBag. Dining room tables and other furniture handcrafted by Hugo & Hoby from trees in their Connecticut hometown. North On Sixty also creates beautiful wood furniture (top photo above) including desks and entertainment units. Consider Bergeron Woodworks for home decor items like frames, mirrors, and trunks - all made with reclaimed wood. Enjoy the soft glow of some GoodLight Natural Candles (photo at left), made with sustainably- and ethically-sourced palm oil. When settling in for the night, choose eco-friendly bedding from Natural Mattress. Rest assured that you are choosing better products for the planet.